I’ve learned a few things while reading your journey down the back roads of trust. 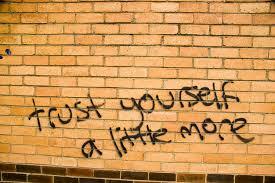 This last post gets at one of the key ones: How do you get people to trust in themselves? I’m adding this to the list of great questions you also posed in your previous post: https://tracymmaurer.com/2015/05/15/why-trust-is-so-important-in-employee-engagement/ . You cover trust in leadership and in the community/network at large in those questions. Love those questions – and it resonates with some themes that have emerged from other discussions I’ve been part of, with other ESN thought leaders. For leaders: It’s not that they need to learn how to trust their employees, it’s what have they done to earn their employee’s trust? For the community/network: Is the culture of the community (you get at this) one that values the trust it creates among its members? Meaning: You do appreciate everyone’s contributions, you don’t use other people’s stuff for personal gain, etc. This last one about getting people to trust themselves I also find really important. For different roles – community manager, organizational leader, instructor – a related question is: Once you get people to actually trust themselves – to take that leap and post something and make some contribution – how do you not screw up that important moment? That’s a really tough one, especially at scale. You and I have both seen those moments. People in class finally cross that line and share something. It’s big for them. How do we not screw it up, by letting it just linger there unrecognized? It may be one of our best chances to model what a trusting, safe, learning environment looks like, and to convert a former non-believer. I know I personally struggle with that one a lot. Somehow the right path seems to be one you pointed out earlier – that community management is a lot about culture building. With a large community or network, maybe the question we should be asking ourselves is: Have I helped foster a culture where someone, somewhere in the community will recognize those big moments when a new contributor finally trusts themselves – and responds with appreciation? At scale – that’s the real key, isn’t it?! When the community is new, and not that many people are posting yet, it is easy to watch and like and reply and provide that important personal touch. I remember a time when I could recognize when there was a post from someone new; being able to say off the top of my head who the top contributors were. But that all goes away at some point, and perhaps that is where a lot of communities falter, and sometimes fail. Putting this in context with what a group of us in The Community Roundtable were just discussing, perhaps one of the keys is to convince lurkers of the value in indicating their appreciation of the content they read and use. Comments are great, but even a few stray likes can make all the difference to someone. And without that feedback, the quantity and quality of posts can easily decline due to people perceiving a lack of interest in their contributions. Yes, it is also important for management and others to do this. But the percentage of community members who consume content is so much larger that they could have a greater overall impact. Thanks so much for the thoughtful response! It helps to get sent down paths that I might not have otherwise found.